In part one of this discussion, I explained how the increasing lack of trust in social media is impacting marketing, and in turn, affecting the trust consumers have in brands on social media platforms. 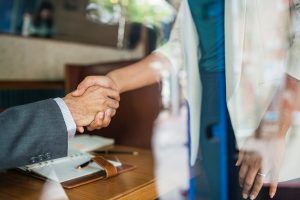 Now it’s time to talk solutions: here are 5 strategies to regain your customers’ trust — in social media, and in your brand. Modern marketers can no longer rely on social media platforms to do the work for them. To make sure your content gets in front of the right eyes, you have to focus on engagement techniques that foster conversation. Building a social media community allows your business to authentically relate, connect, and communicate to your customers at scale. Find your target audience. Do some research to determine which social network makes sense for your brand to create a community. Where are your customers hanging out? And what is the purpose of your community? If it’s to share industry insights, research, or thought leadership, LinkedIn would be a good choice for that because it is a more professional and business-oriented social network. If it’s to share more personal stories or to network with other like-minded individuals, Facebook might be the way to go as it focuses more on connecting on a personal level. And you may find that social media sites may not be the right place to host your community. If you have a very niche expertise, online discussion forums like Reddit ccan get you in front of your target audience faster. Set specific goals. A community built to convert leads should look a lot different than one that’s built to drive awareness or provide customer support. Knowing where you want to go will help you get there faster, so start by picking your top 3 goals / outcomes you want to get out of your community to focus on. Private social messaging has taken over social media, whether it’s private messaging on Twitter and Facebook Messenger, on 3rd party apps like WhatsApp and WeChat, or email. 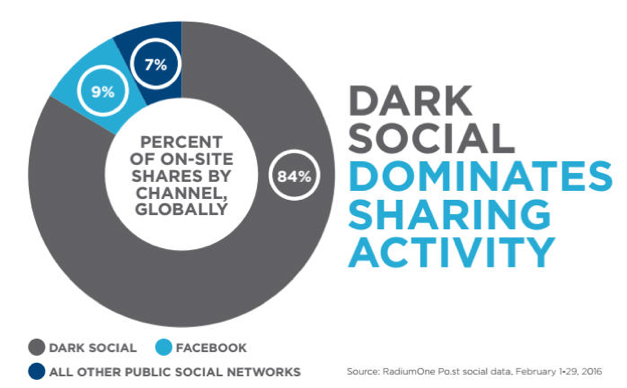 In fact, a study by RadiumOne shows that dark social accounts for over 80 percent of all social shares. As we humans continue exploring new ways to connect with one another, marketers need to take notice and tailor their social media strategies accordingly. Create content that requires public engagement, and provides an added value to the audience if they share in a public forum. But be willing to risk metrics to grow loyalty – build quality content that drives conversation and sooner or later that conversation will become public and measurable. Test ways to incorporate tracking into your program to measure social content consumption and engagement, even when it’s not public. This article shows some great examples for how to set up custom segmentations in Google Analytics to measure dark social shares. The “social” aspect of “social media” has largely fallen by the wayside. Even on a personal level, we use Facebook pages more to share articles than to interact with friends and family. To stand out and build trust in an oversaturated market, companies shouldn’t be cranking out more content, they should be finding consumers within their niche and engaging with them to build a loyal customer base. A great example of this is to create content that connects with your consumers on a human level. Our client SAP Leonardo did just that with this creative and fun Twitter poll that turned complicated technical terms into cocktails! How fun is that?! The poll received over 100 votes, boosted overall engagements for the channel because people were excited to take part in it and respond with their favorite cocktails. Being social is all about human-to-human interaction, so don’t be afraid to publish more authentic content across your social channels. Give your followers a peek behind the curtain and into your company culture, or utilize user-generated content and feature real customers on your social channels. Be the brand that users feel comfortable approaching and the trust will follow. Stop pushing and start engaging. Did a follower do something awesome to interact with the brand? Call it out on social and then follow up off-line with a personal touch. Panera Bread is great example of how a brand can drive real engagement using social listening insights to learn more about their customers. They created several campaigns last year to wow and delight their customers by listening to what fans enjoyed about their brand, engaging with them directly with personalized messages, and offering them gifts for shouting out their brand on social. See below for a few examples! Social selling can play a vital role in building and nurturing brand trust. By answering your customers’ questions and providing them with highly-personalized content, you’re showing them that you understand their challenges and care about their experience – not just trying to get them to buy your product or service. Social selling is all about personalization and connecting with your current and potential customers on a human-to-human level to meet – nay, exceed – their needs. Use social listening conversations to increase sales teams’ understanding of what customers need and want so they can tailor content and offers to address those needs directly. Partner with trustworthy people. Social selling’s power is exponentially increased when you partner with influencers and thought leaders that your customers trust. Don’t choose an influencer that is selling any product they can get money for; instead, choose someone who uses your product or service and will continue to authentically use it in their life. Trusted and credible thought leaders in your industry can act as influencers to help your company reach its target audience in an organic and trustworthy way. How? By being champions for your brand, spreading the word about the value you bring to your industry, and, in turn, helping to position your brand as a trusted advisor to their networks. Having long term relationships with influencers helps to build a steady and ongoing drum beat to support this. If brands are constantly picking up and dropping influencers, their impact will suffer and ultimately it won’t help them rebuild trust – and that’s a problem! Ask them to share your content and collaborate with you on projects and events. 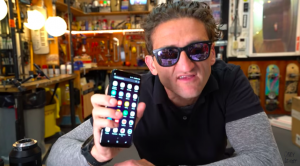 A great example of an influencer collaboration with a brand is this fun video from YouTube star and filmmaker Casey Neistat reviewing a new phone from Samsung. This was not a paid endorsement – Casey just wanted to review the new phone. We hope you found these insights and actions helpful. Got a tip of your own? Share it with us on social!